This mortgage questions post will cover the topics of prepayment. Several questions we have received have related to the topics of prepaid interest and also escrow accounts. Many find it difficult to understand the concept of ‘escrow’ in general. We shall try to make that clearer here. 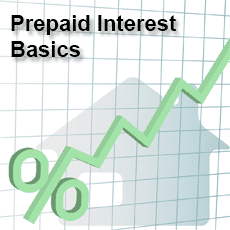 First, however, the question of prepaid interest. Mortgage Question: What is an Escrow Account? We get many mortgage question regarding escrow accounts. When you take a mortgage you have payments to make in addition to your principal and interest commitments. You also have insurance and taxes to pay. Rather than relying on you to make the lump sum payments when they become due, the lender adds 1/12 of these payments to your monthly mortgage repayment. This is deposited into an escrow account. Your mortgage lender should total the annual sum of taxes and insurance premiums. A sum no greater than one-twelfth of that can then be deposited into an escrow account – PLUS a contingency cushion. This cushion should be no more than is needed to avoid overdrawing the escrow account should taxes or insurance premiums be increased. These conditions will be detailed in the mortgage agreement document. Conventional mortgages, not administered by FHA or VA, can waive the requirement for an escrow account if the equity on the property is at least 20% of its value. If you have any mortgage questions you want answered, we will be able to answer the for you,.